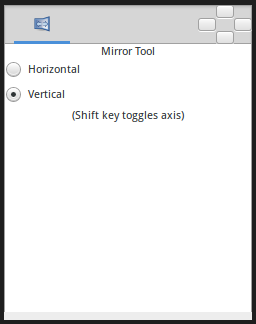 The Mirror Tool will mirror all the selected handles about a horizontal or vertical axis passing through the mouse cursor. Horizontal : Horizontal axis mirror. Vertical : Vertical axis mirror. As soon as you start dragging, the handles will all flip about a vertical axis passing through the duck you're dragging. You will be able to drag the handles around, but the motion will be constrained to only move left and right. This page was last modified on 7 March 2016, at 19:19.